This is my 99th post on the blog, which is something I find pretty awesome. I was hoping I’d stick to this thing when I started, and it’s actually worked out well. Originally I thought I’d try to write a lot more essays/thoughts on older games and gaming culture in general, and at some point I may do some of that again, but shifting to DCC RPG as the game I was playing really ramped up my desire to post actual game-able material. I chose WordPress.com over Blogger for a lot of reasons, but it can be boiled down simply to a personal preference for the user interface. However, there are some limits to using WordPress.com that really bother, especially in the blogroll department — my Links Library page is manually maintained and can’t really do what I want. That’s why as of post #100 I’m going to be moving over to a hosted WordPress blog at ageofruins.com! I still have a bunch of tweaking to do to get the layout and the look where I want it, but all of the posts have been exported and anything on here is now up there. Due to the limitations in coding on WordPress.com blogs, I won’t be able to do a redirect, so I’ll be tweaking this site very shortly with reminders that this is the old version if you land here from a link. If you’ve been following me via WordPress Reader or RSS, you’ll have to update to the new site (I don’t know if you can follow hosted blogs through WordPress Reader), and if you’ve been following me through any other method (Twitter, Facebook), I’ll of course do all the work on the back end so you’ll automatically go to the new site. However you do it, thanks for reading, I genuinely love doing this and knowing that anyone is reading makes it all that much more satisfying! 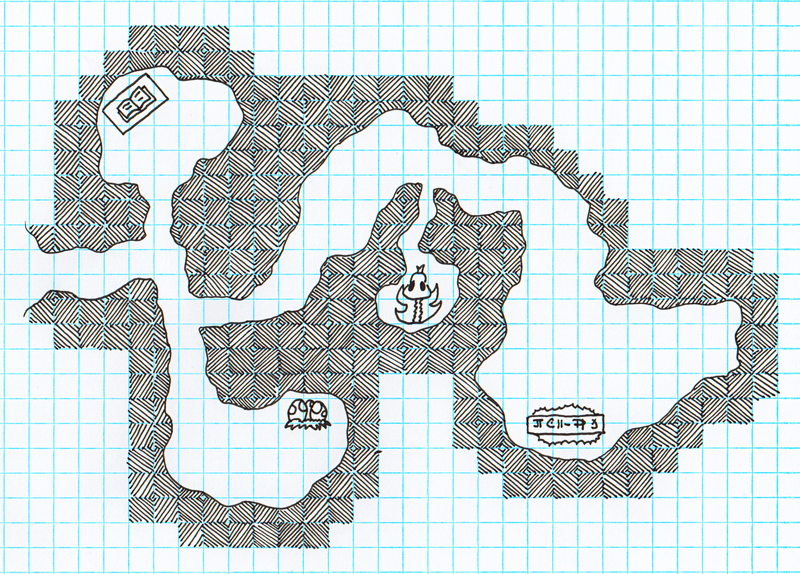 I may be taking a respite from trying to post a map every week; I missed last week because I didn’t have time to get anything drawn and a break would give me some time to build up a reserve on those weeks I do have time. I don’t have a big back-catalog of maps to use because of several purges of my notes I’ve conducted over the years in the interest of reducing clutter. The current game, so far, is leaning toward me running pre-published modules, which fits well with the life/work schedule, but doesn’t provide me a lot of reason to be drawing maps for myself (besides the sheer enjoyment I derive from it, which is considerable). So let’s call this the potential beginning of an indefinitely long hiatus on committing to posting one of these every week (but there may still be some weeks I do). How’s that for noncommittal? Click it to big it. A quick and simple one this week — the icons are not necessarily intended to be to scale, and there’s really not much to the map itself. Maybe an inspiration piece for something I can spend more time on later? After my work in progress post last week, I decided to remove all of the landmarks I had noted during the pen drawing phase. 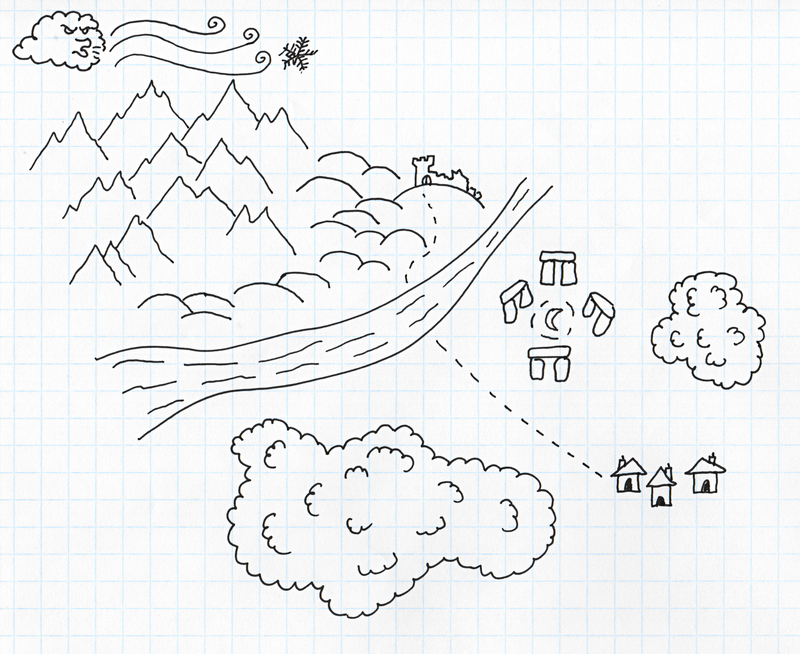 For one thing, I am much happier with my hand-drawn wilderness than with the city/village marks. 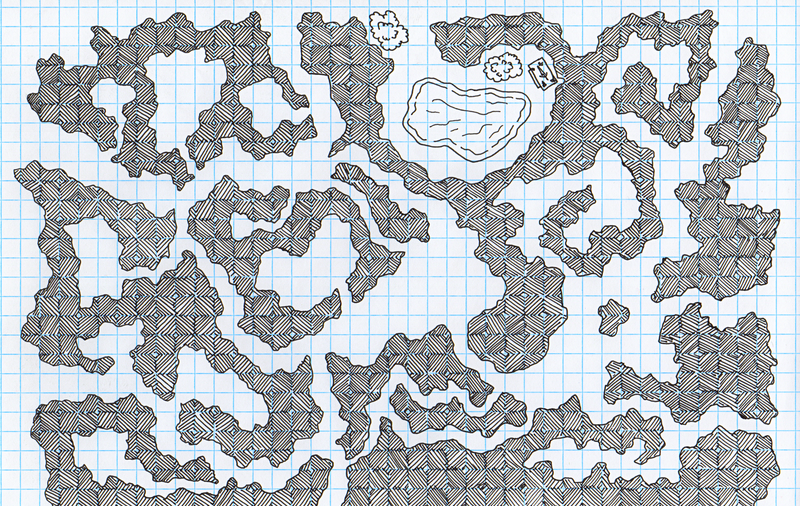 For another, if anyone else actually wants to use this it probably gives more value as a map for them to fill in the details on. 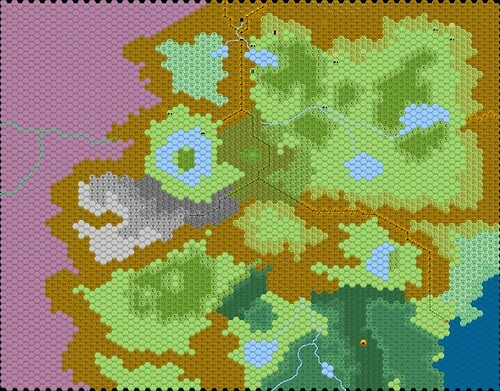 For various reasons, Hexographer isn’t working out as my method of adding icons and numbered hexes to the map. I do at least have a hex overlay version to give scale, though it should be noted that that the width of the rivers isn’t really to scale with the distances — they aren’t all a mile-plus wide. In the version below, 1 hex equals 6 miles. I saw some really awesome, inspiring maps this week, like this wilderness map from Courtney at Hack & Slash and this megadungeon “tourist” map from Gus at Dungeon of Signs. 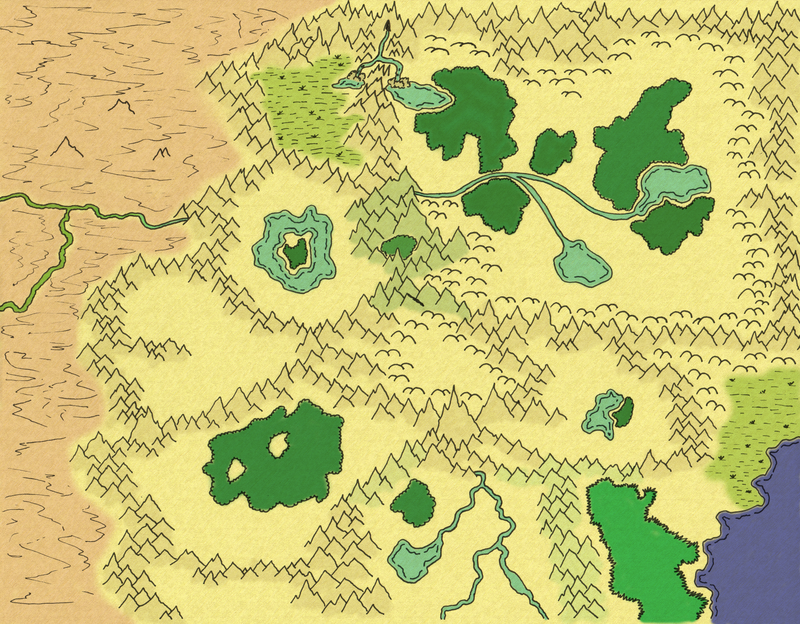 It made me want to follow through with my my recent grumblings about doing a wilderness/region map. I didn’t end up going to crazy with features during the pen drawing stage, as I eventually plan to overlay a numbered hex grid and will reference sites that way. I still have quite a bit to do on this, but there was no way I could finish the coloring and post it this morning –I’m writing this at about 2:45 a.m. Hopefully I’ll have it all done next weekend. I missed posting anything last Saturday, which I was not thrilled about, but it can be tough getting one done every week on top of other posts and real life. I don’t know how Dyson does it! 45 drawn maps that he hasn’t scanned?!? 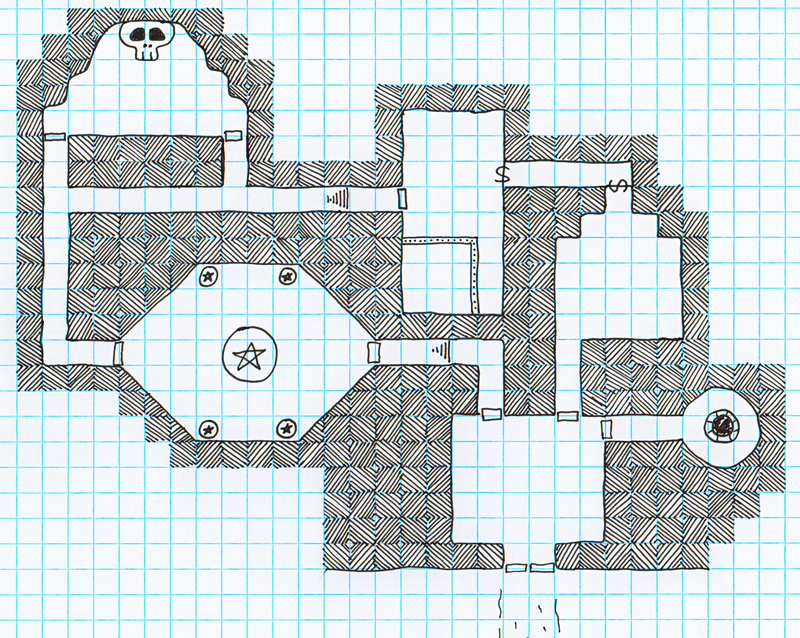 Anyway, I’m thinking I need to keep them simple if I am going to keep this up, which was my philosophy behind this small dungeon. 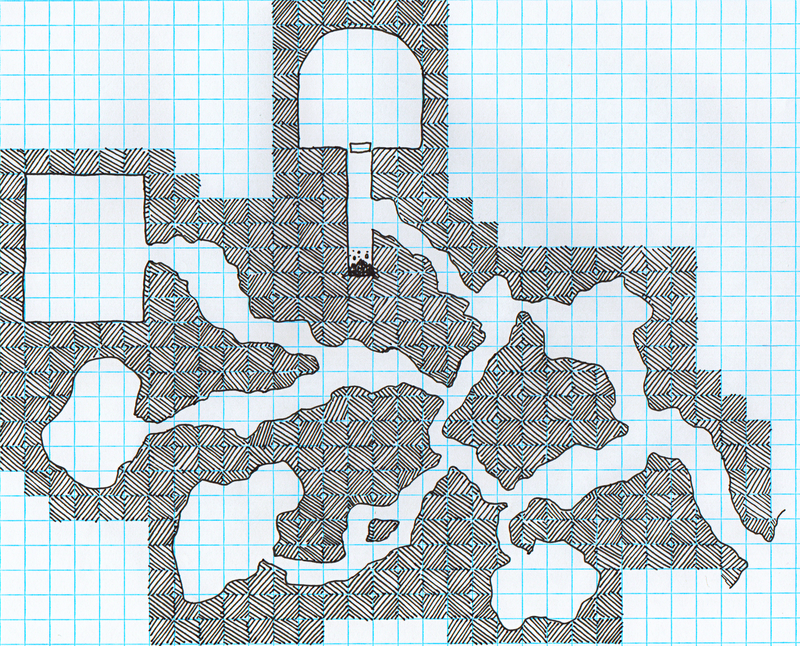 I tend to feel like I’m sort of cheating with these “natural” cavern maps if I don’t add much adornment; it’s really just a bunch of squiggly shapes on graph paper as randomly as the human brain can allow (which isn’t very, really). Still, happy with this. OK, probably closer to 10-15 minutes with post-scanning adjustments, but still knocked out pretty quick either way. More than anything, this was born from not wanting to not have a post, though some things I’ve been reading and thinking about lately crept into it in their own highly generic way. 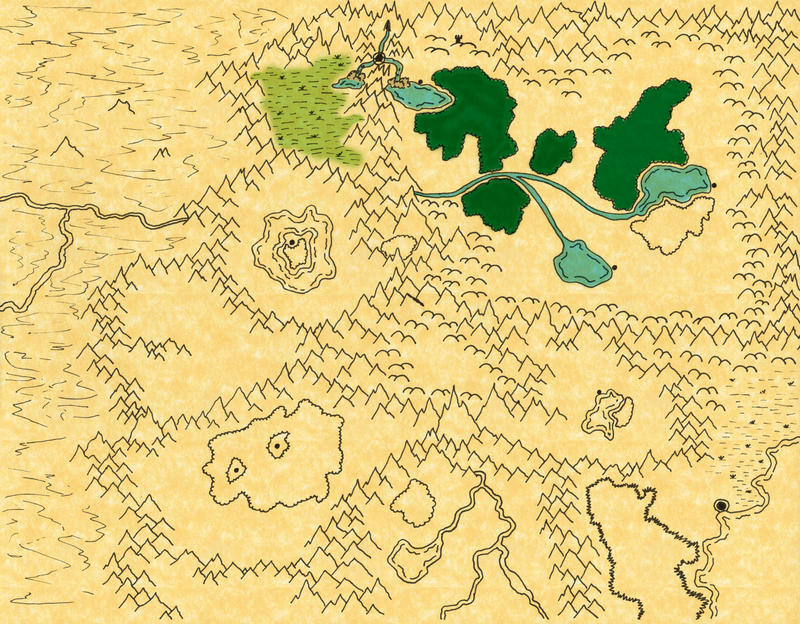 I have been wanting to take a good crack at a hand-drawn wilderness map for a while now, as I used to love those most of all. This one reinforces to me that I should just go back to using symbols for towns and such, though. Stretching for nearly 1,000 miles between the salty marshes at its ends, the Atgur Brutal (“Killer/Death of Men”) stands as a natural barrier between the Atgur Reach and the rest of the northern continent. For centuries Arethi merchants toiled to maintain marked, raised trade routes that would allow safe traversal of the swamp to the Reach, but in the 30 odd years since Iso Kharu’s Wrath the swamp has nearly erased these paths. Countless creatures call the swamp their home, including intelligent beings such as bullywugs and lizard-men. By far the most dominant humanoid swamp dwellers are the rat-men, who once had a great city of their own in the depths of the swamp.